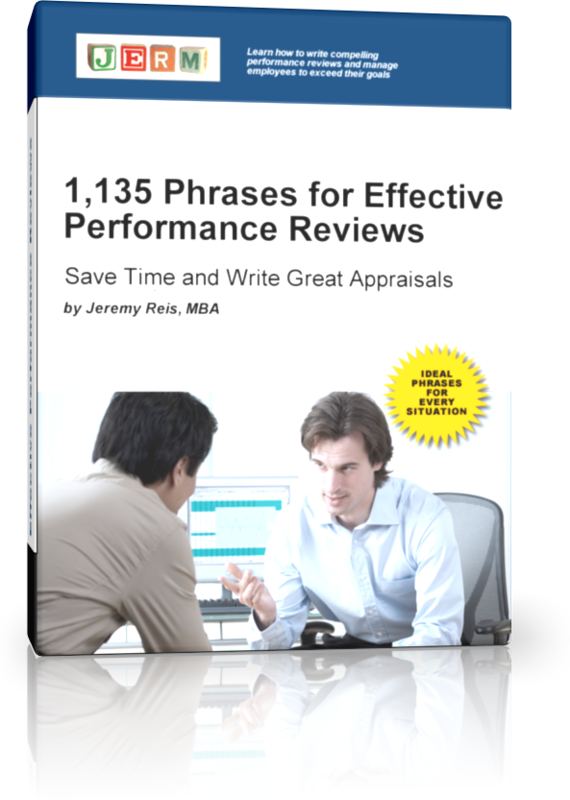 Over 1,100 performance review phrases to write effective performance evaluations. Effective Performance Reviews contains 1,135 complete performance review sentences in over 20 categories to help you finish your employee’s performance reviews quickly and easily. Writing your performance reviews can take hours of time. It’s difficult to find the right words to express your thoughts for each employee, but this book will help you complete your performance evaluations – and save you time in the process. Save Time on Your Performance Review and Say Just the Right Thing! Performance reviews are universally dreaded by managers and employees alike. What is meant for good, to evaluate employees and help them improve each year, has morphed into a time consuming process meant to satisfy human resources. It doesn’t have to be this bad! We’ve written Effective Performance Reviews to help save you hours on writing your self evaluation and find the right sentences to describe each employee! There are 1,135 performance review sentences in over 20 categories with positive evaluation phrases and negative evaluation samples. These performance evaluation samples are professionally written to be descriptive for every situation and are guaranteed to impress your manager and HR. If you struggle to find the right words to complete all of the evaluations, or if you struggle to describe areas of improvement for employees, this ebook will solve the problem for you. This ebook is in PDF format for easy and instant download once you purchase. You are able to copy and paste these paragraphs directly into your performance evaluations. If you want to have a SUCCESSFUL performance review process, buy this book today! I don’t know if I can say enough about this book – it was amazing to find it at just the right time. I had to complete a dozen performance reviews over a weekend and really didn’t have time, but the samples in this book were perfect and I completed the evaluations in no time. I highly recommend this book! I love managing people – but I hate performance reviews. This book made a dreadful experience fun as I could focus on what is important – helping the employee improve, not trying to think of 20 different ways to describe a satisfactory attitude. I love the format of the book. The samples are incredibly easy to copy and paste into the evaluations. The sentences sound professional and describe my employees to a tee. I recommend this book if you want to save time on writing evaluations and spend more time actually managing performance! © 2019 Performance Review Examples Book. All Rights Reserved.